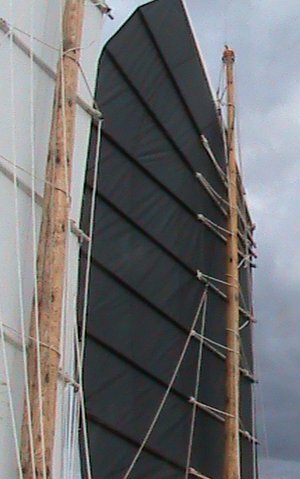 Today, for the first time, I was able to hoist both sails to see how fitted together. I was relieved to observe that the finalised sails are setting very similar to my original plan on paper.Sometimes things work! Unconventional perhaps, but I have gone ahead with contrasting colours – black and white. 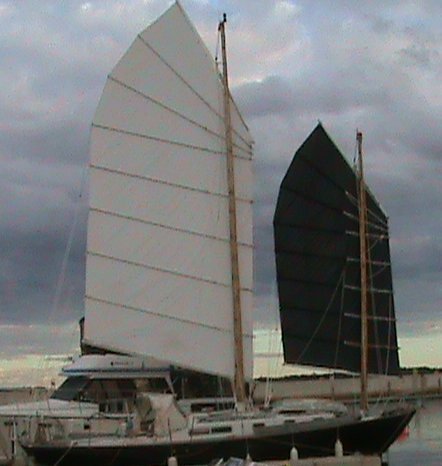 I originally planned to build both sails in black but was unable to source canvas of suitable weight in black for the main but came across 54 inch white canvas (Dacron) at a super price. So white it was. The biggest problem to solve is where to position all the running lines – and where to store the bulk of excess line when the sails are up and working. So far I have the halyards, luff hauling parrels and yard hauling parrels coming into the starboard of the hatch (the wider side because the hatch is on the port side of the boat) and the to sheet lines held by jam cleats on the port side. The three main downhauls come together as a bundle on the starboard side also. I have yet to figure out how exactly to manage the topping lifts lines (4) and fore downhauls (3). I will upload more details and pictures of the layout in a few days.